We have previously reported that the haplodeficient Munc13-1 +/− mouse exhibits impaired biphasic glucose-stimulated insulin secretion (GSIS), causing glucose intolerance mimicking type 2 diabetes. Glucagon-like peptide-1 (GLP-1) can bypass these insulin-secretory defects in type 2 diabetes, but the mechanism of exocytotic events mediated by GLP-1 in rescuing insulin secretion is unclear. The total internal reflection fluorescence microscopy (TIRFM) technique was used to examine single insulin granule fusion events in mouse islet beta cells. There was no difference in the density of docked granules in the resting state between Munc13-1 +/+ and Munc13-1 +/− mouse islet beta cells. While exocytosis of previously docked granules in Munc13-1 +/− beta cells is reduced during high-K+ stimulation as expected, we now find a reduction in additional exocytosis events that account for the major portion of GSIS, namely two types of newcomer granules, one which has a short docking time (short-dock) and another undergoing no docking before exocytosis (no-dock). As mammalian homologue of Caenorhabditis elegans unc-13-1 (Munc13-1) is a phorbol ester substrate, phorbol ester could partially rescue biphasic GSIS in Munc13-1-deficient beta cells by enhancing recruitment of short-dock newcomer granules for exocytosis. The more effective rescue of biphasic GSIS by GLP-1 than by phorbol was due to increased recruitment of both short-dock and no-dock newcomer granules. Phorbol ester and GLP-1 potentiation of biphasic GSIS are brought about by recruitment of distinct populations of newcomer granules for exocytosis, which may be mediated by Munc13-1 interaction with syntaxin–SNARE complexes other than that formed by syntaxin-1A. L. Xie and D. Zhu contributed equally to this work. The online version of this article (doi: 10.1007/s00125-012-2640-z) contains peer-reviewed but unedited supplementary material, which is available to authorised users. Normal insulin secretion requires effective coupling of agonist (glucose, glucagon-like peptide-1 [GLP-1])-evoked signalling pathways to insulin secretory granule exocytosis machinery. The major mode of insulin secretion is insulin granule fusion with the plasma membrane, in which exocytotic fusion molecules, including soluble N-ethylmaleimide-sensitive fusion protein-attachment protein receptor (SNARE: v- and t-SNAREs) and associated protein components (neuronal Sec (nSec)/Munc18 or SM proteins, Munc13), have been defined [1, 2]. Diacylglycerol (DAG) is a major signalling molecule involved in secretion, including insulin secretion, by its actions on protein kinase C enzymes (PKCs) [3, 4, 5]. However, at the level of priming secretory granules for exocytosis per se, Munc13 proteins have been shown to be the major exocytotic substrates for DAG [6, 7], in which the priming function has been determined to be assisting the unfolding of the SNARE protein, syntaxin, to its open conformation to enable SNARE complex formation [8, 9]. We had previously deployed heterozygous Munc13-1 +/− mice reported by Brose and co-workers [6, 7, 8], which showed impaired biphasic GSIS, causing glucose intolerance mimicking type 2 diabetes ; their islet PKC levels were notably normal . Islet levels of Munc13-1 are similarly depleted in patients with type 2 diabetes . GLP-1 has been shown to partially bypass these insulin-secretory defects of type 2 diabetes through cAMP signalling pathways. Thus GLP-1-based therapies are becoming a standard treatment for these patients . GLP-1 rescues insulin-secretory deficiency via cAMP actions on exchange protein directly activated by cAMP (Epac2) and protein kinase A-activated Rab3-interacting molecule 2 (Rim2) . Through these cAMP pathways, GLP-1 stimulation has been found to normalise the reduced biphasic GSIS in Munc13-1 +/− islets, as Epac2 and Rim2 levels in Munc13-1 +/− islets were normal . We found interactions between Munc13-1 and Rim2 to be critical for GLP-1-mediated rescue of exocytotic defects in Munc13-1-deficient beta cells . A recent report showed that Rim2α interaction with Munc13-1 at a post-docking step is required for insulin granule exocytosis . With time-lapse total internal reflection fluorescence microscopy (TIRFM) to monitor exocytosis dynamics of insulin granules, it has been shown that the major insulin exocytotic defect in beta cells in type 2 diabetes is due to the inability of insulin granules docked on the plasma membrane to undergo exocytosis ; this exocytotic defect is in part attributable to reduced syntaxin-1A levels , along with a reduction in cognate SNARE complex and accessory proteins, including Munc13-1 [11, 18]. We here examine, by TIRFM imaging at the level of single granule exocytosis, the effect of several treatment stimuli—glucose and rescue by K+ depolarisation (mimicking treatment with sulfonylureas), phorbol ester (wherein Munc13-1 is the putative substrate) and GLP-1—on the defective insulin exocytosis in Munc13-1-deficient beta cells, compared with wild-type. Consistent with our previous reports [10, 14], the reduction in K+-stimulated first-phase secretion in Munc13-1 +/− beta cells could be attributed to reduced exocytosis of previously docked granules. The novel observation in this study is that the reduction in both first- and second-phase GSIS in Munc13-1 +/− beta cells is attributable more to the reduction in newcomer granules per se. Furthermore, phorbol ester PMA (phorbol 12-myristate 13-acetate) rescue of predominantly first-phase GSIS and GLP-1 rescue of biphasic GSIS are by recruitment of the newcomer insulin granules to undergo exocytosis. These have been described previously and were gifts from N. Brose (Department of Molecular Neurobiology, Göttingen, Germany) [6, 7]. Genotyping of mice was by PCR and DNA electrophoresis as described [6, 7]. Mice were housed under a 12 h light/dark cycle and allowed free access to standard mouse food and water. All experimental procedures were approved by the Animal Care Committee of the University of Toronto. Littermates (Munc13-1 +/−, Munc13-1 +/+) were used in this study. Mouse islets were obtained by the collagenase (2 mg/ml; Sigma-Aldrich, Oakville, ON, Canada) digestion method as previously described , then dispersed into single cells using Ca2+/Mg2+-free phosphate-buffered saline (containing 5 mmol/l EDTA) with 0.25 mg/ml trypsin (Sigma-Aldrich) at 37°С for 5 min with gentle shaking, followed by resuspension in RPMI 1640 medium (Gibco, Langley, OK, USA) containing 11 mmol/l d-glucose. The resulting cell suspensions were plated on glass coverslips and allowed to adhere for ∼48 h before experiments were carried out. Our TIRFM setup (Nikon, Toronto, ON, Canada) was constructed on the basis of prism-less and through-the-lens configuration. Briefly, a condenser coupling multiple lasers (440 nm, 488 nm, 543 nm) was attached to the back port of our Nikon TE2000U inverted microscope, equipped with a ×60 oil immersion objective lens (numerical aperture [NA] = 1.49). We used a 488 nm beam to excite enhanced green fluorescent protein (EGFP) and 488RDC long-pass dichroic and 525/50 nm band-pass emission filters (Chroma, Bellows Falls, VT, USA). Images were collected with a cooled 16-bit EM-CCD camera (Cascade 512; Roper Scientific, Martinsried, Germany). The penetration depth of the evanescent field (∼100 nm) was aligned by measuring the incidence angle of the 488 nm laser beam with a prism (the index of refraction of the prism (n) = 1.5163). Images, totalling 6,000 frames, were acquired at 5 Hz with a 100 ms exposure time. Insulin granule mobilisation and exocytosis were analysed by Matlab (MathWorks, Natick, MA, USA), ImageJ (NIH, Bethesda, MD, USA) and Igor Pro 5.02 (WaveMetrics, Portland, OR, USA) software. A monolayer of primary mouse beta cells was infected with adenovirus encoding neuropeptide Y (NPY)-EGFP and then cultured for 24–36 h before TIRFM. NPY-EGFP plasmid, a gift from W. Almers (Oregon Health & Science University, Portland, OR, USA), was sent to Vector Biolabs (Philadelphia, PA, USA) for generation of an NPY-EGFP adenovirus. Before image acquisition, beta cells were equilibrated for 30 min in Krebs-Ringer bicarbonate buffer (2.8 mmol/l glucose) before being subjected to the following stimulation protocols: (1) 2.8 mmol/l glucose (2 min) followed by 50 mmol/l KCl (8 min); (2) 2.8 mmol/l glucose (2 min) followed by 16.7 mmol/l glucose (18 min); (3) 2.8 mmol/l glucose (2 min) followed by 16.7 mmol/l glucose plus 200 nmol/l PMA (18 min); (4) 2.8 mmol/l glucose (2 min), then 2.8 mmol/l glucose plus 10 nmol/l GLP-1 and 150 μmol/l of 3-isobutyl-1-methylxanthine (IBMX; Bachem, Torrance, CA, USA) (3 min), and then 16.7 mmol/l glucose plus 10 nmol/l GLP-1 and 150 μmol/l IBMX (18 min). All experiments were performed at 37°С. Fusion events, observed as flashes of fluorescence indicating NPY-EGFP cargo emptying, were manually selected and assigned to one of three modes: (1) ‘pre-docked’ secretory granules, which were already visible on the plasma membrane and underwent exocytosis after stimulation; (2) ‘no-dock’ newcomer granules, which fused with plasma membrane immediately on arrival—that is, <200 ms, the interval of one frame; (3) ‘short-dock’ newcomer granules, which appeared and remained on the plasma membrane for >200 ms (more than one frame) before fusion occurred. An increase in EGFP fluorescence exceeding five times the standard deviation of the fluorescence fluctuation was considered to be a fusion event. We used two concentric circles (∼5 and 7 pixels with a pixel size of 267 nm, corresponding to ∼1.335 and 1.869 μm diameter) to centre on selected granules to characterise the evolution of fluorescence over time of single granules on background-subtracted images. Fluorescence of individual granules was measured as mean brightness of the defined circle and annulus. The number of pre-docked granules was counted and averaged over the 2 min before stimulation. A detailed description can be found in electronic supplementary material (ESM) Methods and ESM Figs 1, 2 and 3. Data are presented as means ± SEM with the indicated number of experiments. Statistical significance was evaluated by Student’s t test or the Mann–Whitney rank sum test in SigmaStat 3.11 (Systat Software, Chicago, IL, USA) and considered significant if p < 0.05. We first examined the docking status of insulin granules tagged with Ad-NPY-EGFP in Munc13-1 +/+ and Munc13-1 +/− beta cells. Confocal microscopic examination showed that ∼80% of NPY-EGFP labelled granules close to the plasma membrane colocalised with insulin (ESM Fig. 4). Because the evanescent field generated by total internal reflection illuminates the fluorophones within an ∼200 nm thin layer beneath the plasma membrane, this allows us to capture the high spatial resolution of fluorescence of NPY-EGFP-tagged insulin granules [17, 19]. In the basal unstimulated state (Fig. 1a), punctuate fluorescence was observed, indicating that the density of docked granules did not differ quantitatively between Munc13-1 +/+ (12.7 ± 0.005 per 100 μm2) and Munc13-1 +/− beta cells (11.7 ± 0.01 per 100 μm2). This confirms that defects caused by Munc13-1 deficiency are not due to the inability of granules to dock but rather to their fusion competence (i.e. priming) after docking on the plasma membrane. Upon stimulation of the mouse beta cells, we observed three distinct exocytotic fusion modes similar to previous reports [15, 20, 21]. As shown in Fig. 1b–d, sequential images and corresponding time-lapse fluorescence intensity curves indicate the different fusion modes. ‘Pre-dock’ fusion mode (Fig. 1b) refers to granules already docked on the plasma membrane for a period of time before stimulation. Newcomer granules refer to granules that appear de novo on the plasma membrane within the evanescent field after stimulation and then undergo exocytosis, which can be categorised into two distinct patterns, designated ‘no-dock’ (Fig. 1c) and ‘short-dock’ (Fig. 1d) newcomers. ‘No-dock’ newcomer granules (Fig. 1c) are newly recruited and fuse immediately with the plasma membrane (a docking time of <200 ms, the interval between two consecutive frames); these were called ‘restless’ newcomer granules by Seino and co-workers [15, 20]. ‘Short-dock’ newcomer granules (Fig. 1d) are newly recruited and first dock after some residence time at the plasma membrane, varying from seconds to minutes, and then fuse with the plasma membrane; Seino and co-workers called these ‘resting’ newcomer granules [15, 20]. As reported by others , docked granules were preferentially reduced during high-K+ stimulation. When stimulated with 50 mmol/l KCl, single insulin granule fusion events were observed as flashes of fluorescence, which then rapidly dissipated in a cloud-like diffusion pattern. We verified that the fluorescence dissipation was not due to photobleaching (details in ESM Methods and ESM Fig. 3). Insulin granule fusion events under high-K+ stimulation occur mostly within the first few minutes mainly involving previously docked (pre-dock) granules [16, 20, 21, 23]. Consistently, 50 mmol/l KCl triggered exocytosis of mainly pre-dock granules in the first few minutes from Munc13-1 +/+ and Munc13-1 +/− pancreatic beta cells. Here, there was a ∼39% reduction in exocytosis of pre-dock granules in Munc13-1 +/− beta cells, compared with Munc13-1 +/+ beta cells (black bar in Fig. 2; 18.5 ± 1.8 per 100 μm2 in Munc13-1 +/+ vs 11.3 ± 1.39 per 100 μm2 in Munc13-1 +/−). These results indicate that for K+-induced exocytosis, initial docking of insulin granules on the plasma membrane is required. Reduced exocytosis of pre-dock granules in Munc13-1-deficient beta cells suggests a reduction in Munc13-1–syntaxin-1A interactions causing reduced priming of docked granules [24, 25, 26]. This is consistent with our previous report that the readily releasable pool is reduced in Munc13-1 +/− beta cells during depolarisation stimulation . We previously reported that biphasic GSIS was impaired in Munc13-1 +/− mouse islets . At 2.8 mmol/l glucose, we seldom found spontaneous fusion events (Fig. 3a,b). When stimulated with 16.7 mmol/l glucose, single granule fusion events were observed. In first-phase GSIS, newcomer granules already accounted for >70% of exocytotic events in Munc13-1 +/+ beta cells (Fig. 3a), which corresponded to the diverging cumulative increase in exocytosis in these cells compared with Munc13 +/− beta cells (Fig. 3c). However, fusion events of pre-dock granules (black bars in Fig. 3a,b; summary analysis in Fig. 3d,e) were identical between Munc13-1 +/+ and Munc13 +/− beta cells in first-phase, and also second-phase, secretion. Thus the reduction in exocytosis in both phases of GSIS could be accounted for entirely by the reduction in newcomer granules. In first-phase GSIS, there was a significant reduction in no-dock newcomer granules (white bars in Fig. 3a,b; 6.39 ± 0.22 per 100 μm2 in Munc13-1 +/+ vs 4.17 ± 0.61 per 100 μm2 in Munc13-1 +/−) but not in short-dock granules. In second-phase secretion, there was a reduction in both no-dock (white bars, 8.26 ± 0.75 per 100 μm2 in Munc13-1 +/+ vs 2.02 ± 0.4 per 100 μm2 in Munc13-1 +/−) and short-dock (grey bars, 6.11 ± 1.49 per 100 μm2 in Munc13-1 +/+ vs 2.79 ± 1.1 per 100 μm2 in Munc13-1 +/−) newcomer granules (Fig. 3d,e for summary analysis). These results indicate that Munc13-1 contributed to the priming and fusion steps of newcomer granules during GSIS, but not of the previously docked granules. DAG and phorbol esters are known to potentiate insulin secretion, mainly by increasing the size of insulin granule pools and accelerating the mobilisation of insulin granules for subsequent priming and release . PMA binds Munc13-1 at the same site as DAG [7, 28, 29]. We previously reported that Munc13-1 overexpression in HIT-T15 insulinoma cells potentiates PMA-mediated insulin secretion . Using Munc13-1 +/− mice and DAG-binding point mutant Munc13-1 H567K/+ mice  such as those reported by Rhee et al , we found that PMA potentiated GSIS fully in Munc13-1 +/+ mouse islets but much less in Munc13-1 +/− and Munc13-1 H567K/+ mouse islets; and islet levels of PKCα and PKCε in Munc13-1 +/− and Munc13-1 H567K/+ mice were the same as in Munc13-1 +/+ mice. These results, obtained using in vivo assays, islet perifusion and patch-clamp capacitance measurements, established that Munc13 is a major phorbol ester substrate for priming insulin granules per se for exocytosis. In contrast with these reports, and at the level of single insulin granule fusion, we show that 200 nmol/l PMA potentiated 16.7 mmol/l glucose-stimulated first- and second-phase secretion by enhancing the recruitment of newcomer granules—mainly short-dock granules in both Munc13-1 +/+ and Munc13-1 +/− beta cells (grey bar in Fig. 4a,b; Fig. 4c). Specifically, compared with GSIS alone (without PMA) in Fig. 3, PMA rescue of first-phase GSIS impaired by Munc13-1 deficiency was achieved by enhancing recruitment of short-dock newcomer granules (grey bars; Munc13-1 +/+ from 3.07 ± 1.06 to 6.89 ± 1.08 per 100 μm2; Munc13+/− from 1.88 ± 0.78 to 5.38 ± 0.47 per 100 μm2 in Fig. 4d; Fig. 6e), but there was no additional rescue of second-phase insulin secretion in Munc13-1 +/− beta cells (Fig. 4c,e; Fig. 6f). However, short-dock newcomer granule exocytosis was also enhanced in second-phase secretion (grey bars in Fig. 4a,b; Munc13-1 +/+ from 6.11 ± 1.49 to 11.6 ± 2.3; Munc13-1 +/− from 2.79 ± 1.1 to 4.7 ± 1.19 per 100 μm2 in Fig. 4e; Fig. 6f). These results indicate that the residual Munc13-1 proteins in beta cells of heterozygous Munc13-1 +/− mice are functional, and binding of PMA to residual Munc13-1 proteins in Munc13-1-deficient beta cells accounts for the increase in insulin secretion caused by PMA by preferentially acting on short-dock newcomer granules. Other DAG substrates have been implicated in the insulin secretory process on the basis of considerable work carried out on PKCs as PMA targets [3, 4, 5]. PMA also activates protein kinase D, RasGRPs and DAG kinase with equal potency . However, at the level of priming of insulin granules for exocytosis per se, Munc13-1 plays a more dominant role. The other exocytotic protein, Munc18a, which can be phosphorylated by PKC, is of course an indirect substrate of DAG . However, the exocytotic deficiency we observed in these results is attributable to the Munc13-1 deficiency per se. We had previously reported that GLP-1 rescues both first- and second-phase GSIS in Munc13-1 +/− islets and had therefore assumed that the rescue was of pre-dock granules . Here, we determined the precise exocytotic events rescued by GLP-1 (Fig. 5). At 2.8 mmol/l glucose, in either the absence or presence of GLP-1 (with IBMX), we seldom found spontaneous fusion events (Fig. 5a,b). When 16.7 mmol/l glucose was added after preincubation with 10 nmol/l GLP-1 plus 150 μmol/l IBMX, GLP-1 potentiated GSIS in the first and second phases by enhancing the recruitment of newcomer granules, including both no-dock and short-dock granules, to undergo exocytosis in both Munc13-1 +/+ and Munc13-1 +/− beta cells (white and grey bar in Fig. 5a,b; Fig. 5c). 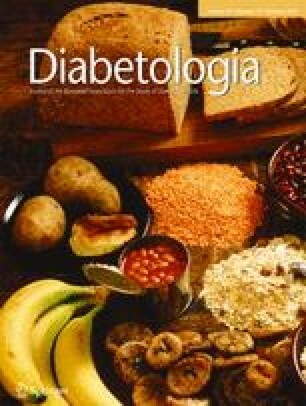 Comparing 16.7 mmol/l glucose-only stimulation in Fig. 3 with GLP-1 rescue of first-phase GSIS, the enhanced recruitment of no-dock newcomer granules, which was lower in Munc13-1 +/− beta cells (white bar: 4.17 ± 0.61 per 100 μm2, Fig. 3d; Fig. 6c) than Munc13-1 +/+ beta cells (white bar: 6.39 ± 0.22 per 100 μm2, Fig. 3d; Fig. 6c), was nonetheless increased to the same extent (white bars: Munc13-1 +/−: 11.4 ± 2.47 per 100 μm2 vs Munc13-1 +/+: 11.6 ± 1.69 per 100 μm2, Fig. 5d; Fig. 6c). GLP-1 also potentiated recruitment of short-dock newcomer granules to exocytosis in Munc13-1 +/− beta cells in first-phase GSIS (from 1.88 ± 0.78 to 4.98 ± 1.25 per 100 μm2 in Fig. 5d; Fig. 6e). GLP-1 also rescued second-phase GSIS in Munc13-1 +/− beta cells by enhancing recruitment of no-dock newcomer granules (white bars: from 2.02 ± 0.4 to 10.3 ± 2.38 per 100 μm2 in Fig. 5e; Fig. 6d) to the same extent as in Munc13-1 +/+ beta cells (white bars: Munc13-1 +/+ from 8.26 ± 0.75 to 11.6 ± 1.53 per 100 μm2). GLP-1 also potentiated recruitment of short-dock newcomer granules to exocytose in Munc13-1 +/− beta cells in second-phase GSIS (from 2.79 ± 1.1 to 6 ± 0.67 per 100 μm2 in Fig. 5e; Fig. 6f). Taking the results together, GLP-1 rescue of biphasic GSIS impaired by Munc13-1 deficiency can be attributed mainly to increased recruitment of newcomer granules, including both no-dock and short-dock granules, occurring in both first- and second-phase GSIS. Membrane fusion is mediated by a trans-complex formed by three SNAREs (synaptobrevin, synaptosomal-associated protein of 25 kD [SNAP25], syntaxin-1A) on apposing membranes, the assembly of which is induced by Sec1/Munc18 (SM) and Munc13 proteins . Both SM and Munc13 collaborate to transform syntaxin-1 from its inactive closed conformation to an activated open conformation capable of binding SNAP25 and vesicle-associated membrane protein 2 (VAMP2) to form the operational trans-SNARE complex [31, 32]. While much is known about how these exocytotic proteins interact to mediate exocytosis of docked granules, very little is known about their role in the recruitment and exocytosis of newcomer insulin granules, a major mode of exocytosis in islet beta cells, which in this work we show to involve the priming protein Munc13-1. In this study, we have shown that the haplodeficiency of Munc13-1 +/− mice did not affect the number of docked granules in the basal state, which confirms that defects caused by Munc13-1 deficiency are not due to the inability of the granule to dock on to the plasma membrane, but rather to its subsequent priming and fusion competence (Fig. 1). Granule docking is required for K+-induced exocytosis [15, 16, 20, 21, 22, 23], which we confirm here. We found that KCl mainly triggered exocytosis of previously docked granules in the first few minutes of stimulation without affecting newcomer granules, and this elicited a stronger response in Munc13-1 +/+ beta cells than in Munc13-1 +/− beta cells. Reduction of exocytosis of pre-docked granules in Munc13-1 +/− beta cells by high-K+ stimulation (Fig. 2) is consistent with our previous study using patch-clamp electrophysiology showing that the readily releasable pool in Munc13-1 +/− beta cells was reduced during electrical depolarisation . These results indicate that Munc13-1 deficiency indeed perturbed the transition from the closed conformation syntaxin-1–Munc18-1 complex to the trans-SNARE complex [31, 32], mediating fusion of docked insulin granules. GSIS was reduced in both first and second phases in Munc13-1 +/− pancreatic beta cells, which can be attributed to a reduction in the number of newcomer granules (Fig. 3). However, fusion events of pre-docked granules were identical between Munc13-1 +/+ and Munc13-1 +/− beta cells in both phases of GSIS. In first-phase GSIS, there was only a reduction in no-dock newcomer granules (white bars in Fig. 3a,b), while the reduction in second-phase GSIS could be attributed to both no-dock (white bars) and short-dock (grey bars) newcomer granules (Fig. 3d). These results indicate that, in GSIS per se, Munc13-1 seems to play a quantitatively more important role in mediating the priming and fusion steps of newcomer granules than pre-docked granules, the latter preferred by K+ depolarisation. We previously reported that total islet insulin content was comparable in Munc13-1 +/+ and Munc13-1 +/− mice . Thus the larger secretory response in Munc13-1 +/+ mice was not due to a greater beta cell insulin content. We then examined the distinct rescue patterns of phorbol esters and GLP-1. PMA potentiated biphasic GSIS in Munc13-1 +/+ and Munc13-1 +/− mouse islets  with a much greater effect on the first phase, and this rescue can be attributed to increasing the recruitment of mainly short-dock newcomer granules (grey bar in Fig. 4a-c). These results indicate that residual Munc13-1 proteins in Munc13-1 +/− mice beta cells are functional and can bind exogenous PMA, which seems to preferentially act on short-dock newcomer granules. In contrast, GLP-1/cAMP’s more potent and complete rescue of both first and second phases of insulin secretion in Munc13-1 +/− beta cells to the same extent as in Munc13-1 +/+ beta cells  we now attribute to increased recruitment of both short-dock and no-dock newcomer granules in both the first and second phases of GSIS in Munc13-1 +/− beta cells (Fig. 5). Thus it seems that, while short-dock newcomer granules are sensitive to both GLP-1/cAMP and PMA (acting on Munc13-1), no-dock newcomer granules are more responsive to GLP-1/cAMP than PMA activation. Syntaxin-1A deficiency impairs docking of insulin granules to the plasma membrane as well as reducing exocytosis of docked insulin granules . K+-mediated membrane depolarisation per se, causing Ca2+ influx from membrane Ca2+ channels, acts on this population of docked granules. Consistently, deficient Munc13-1 levels and consequent reduced priming of syntaxin-1A would likewise reduce K+-mediated exocytosis of pre-docked granules, as observed in our study. Strangely, glucose stimulation, PMA and GLP-1 potentiation of GSIS seem to act preferentially on the populations of newcomer granules that are apparently able to bypass the docking step(s). This would at least in part explain the efficiency with which GLP-1 is able to rescue insulin secretion in diabetic rodents and patients, where levels of Munc13-1 and syntaxin-1A are greatly reduced . It is possible that the reduction in exocytosis can be attributed to inadvertent effects of Munc13-1 deficiency on Ca2+ channels or Ca2+ homeostasis. We have previously shown that Ca2+ channel amplitudes and gating in Munc13-1 +/− mouse beta cells  are not perturbed and are identical with Munc13-1 +/− beta cells. We further measured whole-cell calcium responses in Munc13-1 +/− and Munc13-1 +/+ beta cells (ESM Fig. 5), which showed no differences in response to K+ alone or in combination with PMA or GLP-1. However, it is still possible that these different modes of exocytosis, particularly the no-dock and short-dock newcomer granules, are modulated by discrete local Ca2+ microdomains, as postulated by Rorsman and co-workers , which will require further study. GLP-1-mediated cAMP actions on beta cell Guanine nucleotide exchange factor 2 (GEF2) and RIM2 are well known , which include Rim2α interactions with Munc13-1 at a post-docking step in insulin granule exocytosis [14, 15]. Seino and co-workers showed that Rim2α deletion reduced both newcomer and docked insulin granules . They also showed GEF2 interactions with sulfonylurea receptor , which, along with an early report that sulfonylurea- dependent stimulation of insulin exocytosis is PKC-dependent , suggests an even more intricate relationship between these apparently unlikely partners of the exocytotic machinery. Since syntaxin-1A has been shown to mediate fusion of docked insulin granules but not newcomer granules , fusion of newcomer granules per se is likely to be mediated by a SNARE complex(es) other than that formed by syntaxin-1A, but which our study suggests could also be primed by Munc13-1. While further work is required to elucidate these novel SNARE complexes that act on newcomer granules, a potential candidate may be syntaxin-2, which an earlier study showed Munc13-1 binds to . No other studies have been reported on Munc13-1 binding to other exocytotic syntaxins, including syntaxin-3 and syntaxin-4. While syntaxin-4 has been shown to have a preference for second-phase GSIS [37, 38], the precise exocytotic step mediated by it (i.e. newcomer granules) has not been elucidated. Indeed, very little is known about the molecular machinery that controls the recruitment of newcomer insulin granules, a population of granules that can overcome the exocytotic defects of type 2 diabetes. Much work remains to be performed to assess which syntaxins (-2, -3 and -4) Munc13-1 can prime to bind to also as yet unknown cognate exocytotic proteins in beta cells to form the fusion complexes that specifically mediate the recruitment and fusion of the two populations of newcomer granules, short-dock and no-dock. This work was supported by a grant from the Canadian Institutes for Health Research (MOP 86544) to H. Gaisano, a postdoctoral fellowship from the Canadian Diabetes Association to L. Xie, and a grant from the Banting and Best Diabetes Centre, University of Toronto to D. Zhu. LX and DZ did all the experiments, design and data analysis; LX, DZ and HYG provided concept and wrote and revised the manuscript; all authors approved the final version of the manuscript.